After several years enjoying my 05 jdm sti (ej207 twinscroll) stock, i have finally decided i want more performace. Only realy after a few more ponies but keen not to ruin it with unbearable drone or take away from its beautifully wide power band and most imprtantly i want to ensure engine longevity/safety. Essentially i am thinking aftermarket (legal) exhaust, induction kit, fuel pump and a map and i would be grateful for advice on all of these (and any other musts for this type of modification). Any help would be really apreciated! Thank you! I think firstly it's good to try and get the exhaust flowing better, this doesn't mean noise but ideally a system with sports cat could be beneficial and also it saves hassle at MOT time. I run an 05 Spec C WR, managed to find a resonated Miltek turbo back exhaust system with sports cat and I have to say it is quite reserved from a noise point of view at cruise but opens up into a lovely muted scream with a few revs but doesn't hassle the sound meter at the circuit! From memory around 91-92db at 5000rpm. I'm also Midlands area but mine was mapped by Jamie at Evotune when imported, gives massive amount of low end grunt and a wide spread of torque ideal for the road (currently 360ft/lb and 335bhp) with drop in air filter and exhaust only. For location I would highly recommend speaking to TDR at Warwick for any mapping/servicing and tuning suggestions, they will be able to point you exactly where you need to go to achieve what you want if you need details. thanks kev_sti realy helpful. I have seen a miltek system in budget but its not got a cat. Infact i am strugeling to find many systems with a cat at all for the twinscroll. Was that miltek oe or has it been modified? I have a quote from an exhaust welder to put a sport cat in an off the shelf down pipe so thats an option. IJust keen to keep noise down and make the install as pai less as it can be (which obviously an off the shelf would help with). If you dont mind me asking, where did you get it? Also what induction kit did you run? Or was that literally with a change in filter? And no change to fuel pump or plugs? 335bhp and 360ft/lb would be plenty i am sure. So grateful for the advice. Thank you! thanks raggy doo - i am supprised to hear that though, so far i have only read good thibgs about hks systems. What makes you say that? Performace issues or quality or sound? Keen to hear the specifics if you have time. right good to know. Thanks. Any good alternative suggestions or guidance for me? No worries. Miltek produced an off the shelf system a while back but I think may be discontined now, i was lucky to find a 3” resonated Downpipe new but through another forum along with the rest of the matched catted system in used but excellent condition from eBay. Another system you could consider is a Fujitsubo, Torque GT import them from Japan, very nicely built and you can get quieter and loud systems as required. Also Haywood and Scott build a system for the twinscroll so there are options out there, you’ll find that the twinscroll is a bit quieter than a single scroll but I’d stick with a resonated system if you want to track it I reckon. The air filter is a drop in Cosworth filter, doesn’t change the noise but standard air box should be the best option unless you going massive power. Plugs are colder NGK iridium items gapped accordingly. 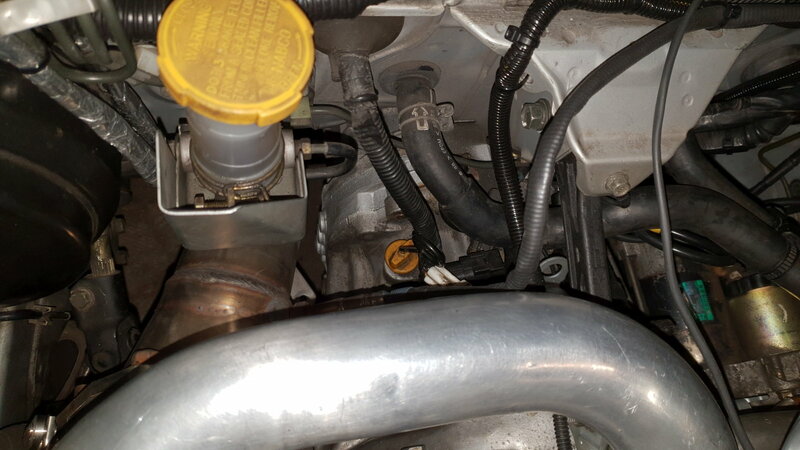 Injectors and pump all standard. yeah i cant find any miltek catted systems (yet) and the torque gt fujitsumo system doesn't have a cat or down pipe at all for that matter. perhaps a stupid question but geometrically/routing i assume i can chop and change with down pipes and cat backs if that way inclined? Ie fit a milteck centre and rear sectuon with an hks downpipe or whatever? The hks complete system looked like a good call but raggydoo abobe seems to think hks aren't all that anymore. Ah ok. Is there any down sides othet than cost for changing induction kit (i know im not after megga power but the induction/turbo noise was the one additional bit of theatrics i was remotely looking forward to)? Am i just being a bit of a child? again apologies for all of the questions, i am realy grateful for the guidance from someone with the knowledge and a similar car to what i am after! Thank you! You maybe need to do a bit of homework if you want to chop and change parts especially with Milltek as I think they produce their parts with different fittings/lengths precisely for the reason so you can’t do that! A lot of the Jap exhausts can be interchangeable but it’s also quite common for someone like Fujitsubo to make single piece systems as well. Have a chat with Alyn at AS Performance, he may be able do source you a new Milltek, worth an enquiry. I have a HKS Kansai service built Evo and I can say the quality of the HKS parts on that is something else however a lot of the parts are specifically engineered by Kansai service so I can’t comment 100% on the latest HKS parts quality. The titanium exhaust however is a stunning piece of kit! regarding air filter that’s personal choice, if it’s just for noise then by all means fit an open filter, I’ve ran many in the past an never had an issue, fitted alongside your exhaust and with mapping it should be spot on. I like the HKS mushrooms (I know a lot of people hate them) as they give the most noise if that’s what you want! Sounds like its best to stick to a sigle manufacturer then but as you suggest will do some homework. Will give Alyn a buzz about sourcing a miltek too. Realy like the idea of the hks system for simplicity and sound but deffo some more research required as to what i can get my hands on. As for the induction i may as well indulge the inner child in me on the induction noise front if there is no down side. I was looking at the hks mushroom or the rcm induction. Bit of a cost difference but the RCM one looks a little higher build quality but hks looks like better packaged/integrated under the bonnet. Again some more research required perhaps. Either way, i really appreciate all the advice. Thank you. i will keep you posted on what i do and how it works out for me. ace thanks. Will google mattyb and see what i can get. Thanks! The mid pipe on my spec C hatch is HKS, but it's 2 1/2", not 3; I looked into getting an HKS sports cat to match it, but it appears they don't do 3". Another twinscroll hatch had an mot advisory on his new Hayward and Scott full exhaust after 1 year, under 2500 miles. This was last year, so personally I would avoid H and S, although he had tracked it, so no warranty . I spoke with H&S and their cat is 100-cell so the car will need a good blast before it goes in for a test to get the cat hot. Ceramic coating it will help. I am on a similar boat and haven't decided what sports cat to use for my twin scroll hatchback. H&S are OK but they look like they have been put together by a child. No, not emissions, leaks from welds. This is shocking to hear. If/when the time comes, I may purchase a HJS cat and find a place to custom make me an exhaust then. Last edited by fpan; 06 February 2019 at 03:31 PM. I have an HKS Sport Cat fitted to my twinscroll JDM Spec B Legacy mated to twin Nur Spec (not R) rear tail pipes via the OE Y Pipe. The quality on the tail pipes and Sport Cat is light years ahead of the UK stuff, a work of art, particularly the welds and joints. I am aware HKS do a sports cat downpipe but the diameter is 75mm as far as I can tell whereas H&S told me they use a 12.7cm (5") diameter cat. That should make a big difference in the flow. Also for what it's worth, the HKS is not an open bellmouth type, not sure what effect that has - if any, whereas the H&S is an open bellmouth if I am not mistaken. @ hedgecutter, would you be able to confirm with your friend if his cat is 5" diameter? Last edited by fpan; 06 February 2019 at 04:47 PM. Ok. Thanks all. I have made a decision on the exhaust. And indeed the fuel pump. But now the engineer and the child that both live in my head are arguing about induction. To go short induction with a cone and risk hot air injestion to get the fun noise and theatrics that make the child happy or do the sensible thing and drop a higj flow panel in the oe induction amd keep it spunding sedate at the front but keep temps down. any thoughts on the matter? Or links to other threads? do air boxes or hot air sheilds do the job? Or does a good air box also just rob all the fun noises and theirfore negate the point? I need a catted twin scroll downpipe as well. £660 for the H & S feels a bit expensive with all those ugly joints and welds that others manage to do in one piece instead. And they charge £78 to ship it to Sweden where others can ship a downpipe for about £40. So for £738 I would expect it to be of amazing quality and I'm not sure it is. Yes but the decat RCM downpipe I have sits very very close to the gearbox as it is so welding a cat in place would propably mean that it almost would touch the gearbox. There's about 15mm between the 3" decat pipe and the gearbox right now. A normal 4" diameter cat adds 12.7mm to one side. So the whole downpipe would have to be changed for more clearance in that case. one side to the pipe. Last edited by Turbovin; 11 February 2019 at 02:12 PM. If it's a chinese $hit perhaps, unless I am mistaken. Have a look at HJS's website for real prices. Just to add- yes milltek's centre section is shorter than standard and it pulled my racebox backwards enough that the rear hangar was hitting the subframe. You can get around this by making a spacer but you're best off just picking up a centre section from a different manufacturer that is interchangeable. I've seen plenty 2nd hand on ebay recently for £40ish. Last edited by Farfocell; 11 February 2019 at 08:21 PM.